Name: John Francis Leddy, D.Phil., D.Litt., D.es L., LL.D., D.C.L. Francis Leddy was born in Ottawa, in 1911, but moved to Saskatoon with his parents at the age of two, so that we may justly claim him as a Westerner. He received his bachelor’s and master’s degrees from this University. He carried out post-graduate studies in classics at the University of Chicago, and attended Exeter College, Oxford, as Saskatchewan Rhodes Scholar. He received the bachelor of letters degree in 1935 and became a doctor of philosophy in 1938. Another noteworthy achievement of that year was his marriage to Kathleen Beatrice White, BA, who is also a graduate of this University. Dr. Leddy joined the faculty of the University in 1936 as a member of the Department of Classics. 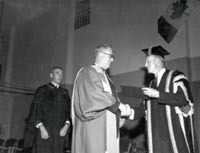 Just ten years later he became Professor and Head of the Department; Dean of the College of Arts and Science in 1949, and Vice-President (Academic) in 1961, a post which he held until he left us to become President and Vice-Chancellor of the University of Windsor last year. During the past fifteen years Dr. Leddy has gained impressive stature as a leader in educational matters at home and abroad. In many widely published addresses and articles, he has stressed the importance of higher education, particularly in the humanities; and in language clear, forceful, witty and eloquent has appealed for increased emphasis on education and greater support for it. Humanities Research Council of Canada, Classical Association of Canada, Canadian Catholic Historical Association, Canadian National Commission for UNESCO, and World University Service of Canada. Recently he was elected international vice-president of the World University Service, and appointed vice-chairman of the Canada Council. As a result of the many important positions he has filled, and as a consequence of the high esteem in which he is held in the academic community, Dr. Leddy has travelled widely. He has attended as official Canadian delegate no less than twenty international conferences on five continents, missing, I believe, only South America and Antarctica! His Church has recognized his contributions in the field of education and his example as an outstanding Catholic layman by bestowing many honors on him. In 1964, Dr. Leddy was made a Knight Commander of the Order of St. Gregory the Great. This is the most recent of many similar honors he has received. Five Canadian Universities have awarded honorary degrees to President Leddy in recognition of his eminence in the Canadian and International educational scene. We join them in this recognition today: but we are particularly aware of the contribution he has made to our own University. For fifteen years he guided the affairs of the College of Arts and Science with wisdom and skill, In deliberations of Committee, Faculty and Council he showed a unique ability to recognize the core of a problem, and to present his point of view with cogency, in beautiful language, and often with devastating wit. Truly, his imprint on the structure and thought of the University of Saskatchewan will be a lasting one.